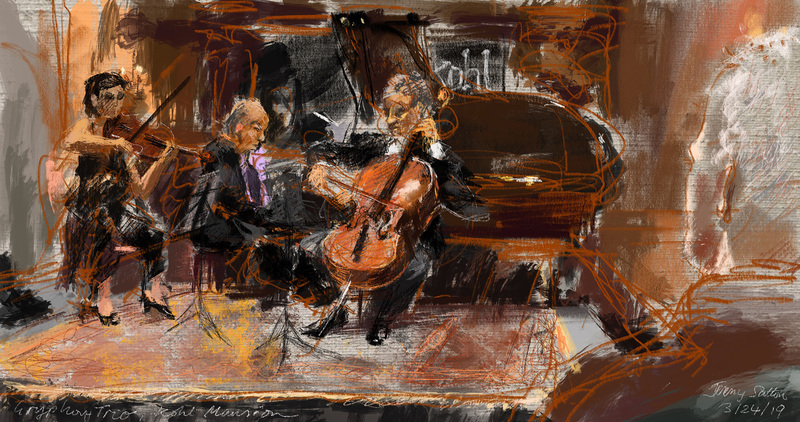 This time-lapse replay video shows the unfolding of the creative process of an iPad painting that was created on March 24th, 2019, during a concert of the Gryphon Trio at the historic Kohl Mansion in Burlingame, CA, part of Music at Kohl Mansion for which I am Painter-in-Residence for their 2018-2019 season. The music featured on this replay video is Antonín Dvořák’s “Dumky” Trio No. 4 in E Minor, Op. 90, B. 166, one of the pieces they played in this concert. Many thanks to the fabulous and inspiring Gryphon Trio and to Patricia and her magnificent Music at Kohl Mansion team!